Welcome to the seventh in our series of weekly puzzles. If you were wondering about the title, this is puzzle no. 007. Anax is experimenting once more. This one should be medium difficult, say four stars. See if you agree. For the last puzzle there was a conscious effort to try and produce something quite easy, and for me that was a bit like play-acting, taking on a role somewhat removed from the real Anax. It was an enjoyable exercise so I decided to try something else. 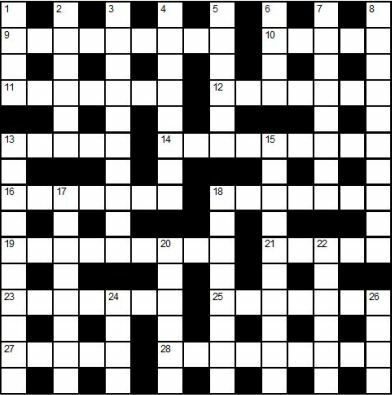 This time, I imagined a scenario where a typical monthly puzzle magazine introduces what it chooses to advertise as a “mega-tough” cryptic puzzle; we all know that what passes for mega-tough in a puzzle mag is probably on the easy side for solvers of quality daily newspaper cryptics. So here was the challenge; how advanced could I make the clues while sticking to the notion that they were to be not quite as hard as it might say on the tin? In terms of style I’ve tried to emulate the way puzzle magazine cryptics tend to be presented, so a quick count shows no less than four clues finishing with exclamation marks – they may occasionally point to something unusual, but more often they serve only to remind solvers that the answers are coming from wordplay. And, of course, puzzle magazine editors prefer conciseness in cryptic clues, as their typical readership can be scared off by ones which are lengthy and thus appear impenetrable. The only diversion from the standard fare is that I’ve been more adventurous with some of the wordplay indicators – but have I overstepped the mark? If you prefer your puzzles on paper, click on the grid to download a pdf of the puzzle.